Let’s talk about that post-vacation slump. You know, when you don’t want to go back to real life so you’re still eating junk for every meal and telling yourself that you’re just too busy recovering from vacay to eat healthy. Or workout. Or do laundry. Or even take your makeup off at night. I have been in it since I went to Salt Lake City last month. I left for New Orleans, like, a week and half later so it’s seriously been a month of unhealthy eating and skipping the gym. This week, I’ve decided to get back on track. I prepped a ton of veggies and proteins on Sunday (it was on my snapchat: amandalivesay) and I’ve got a fridge full of Bolthouse Farms® beverages. 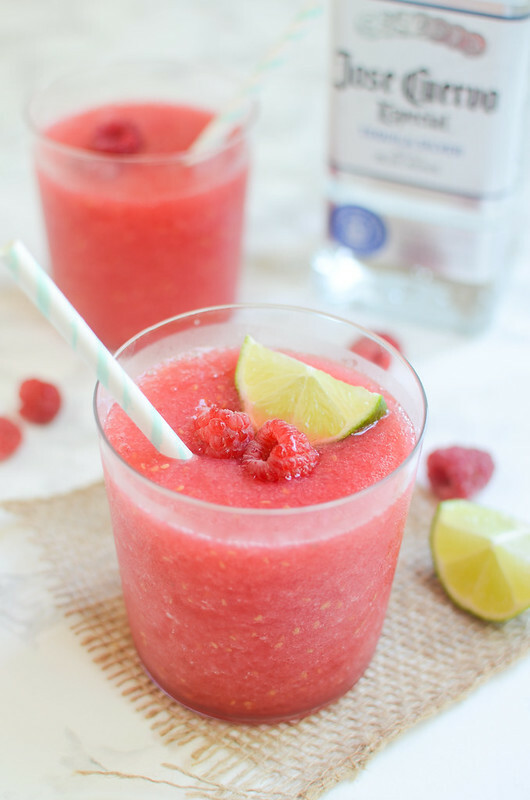 It occurred to me yesterday that I didn’t make a single recipe in preparation for Mother’s Day so I’m also pitching these Raspberry Margaritas as the perfect thing to make for your mom this Sunday. I mean, moms love margaritas, right? At least every mom I know loves margaritas. My mom friends really, really love margaritas. And it’s pink! Moms definitely love pink things! 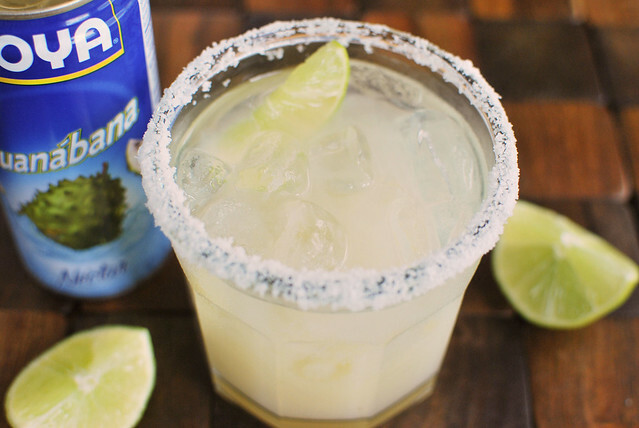 Frozen margaritas are so easy because you literally just pour everything in a blender and press go. 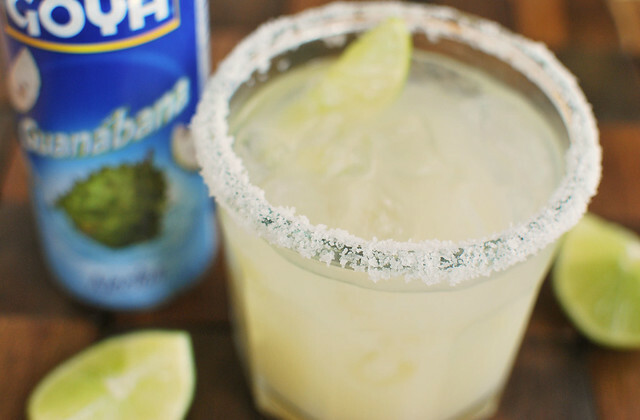 There’s no “Do you shake or stir margaritas?” google search necessary. There’s no fussy muddling of raspberries happening here. Just dump everything in and blend until it reaches a good consistency. 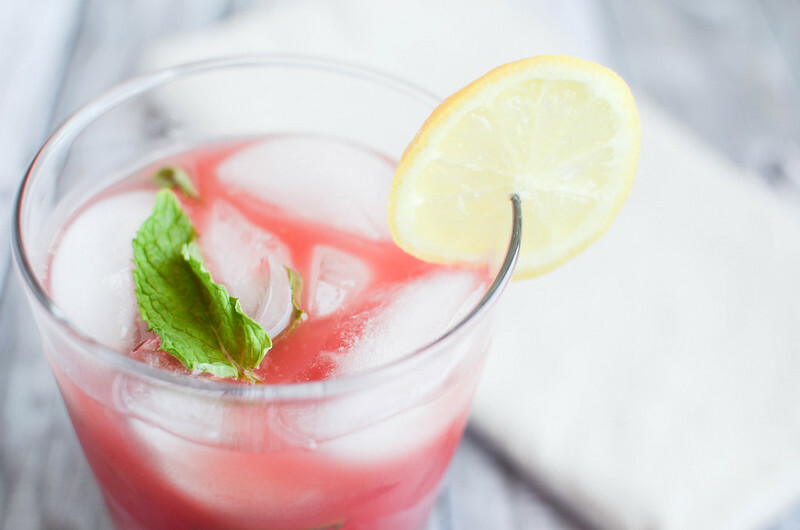 I love drink recipes like that. 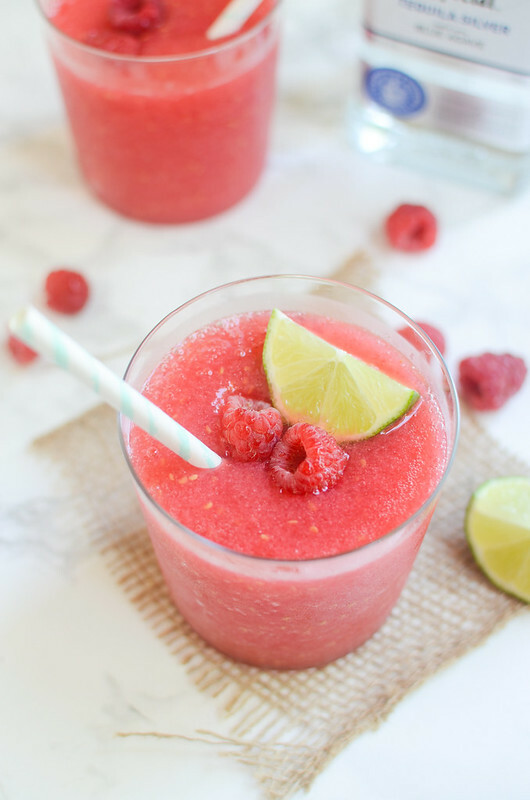 These are really refreshing and perfect for this time of year when the raspberries are looking all fat, juicy, and delicious! 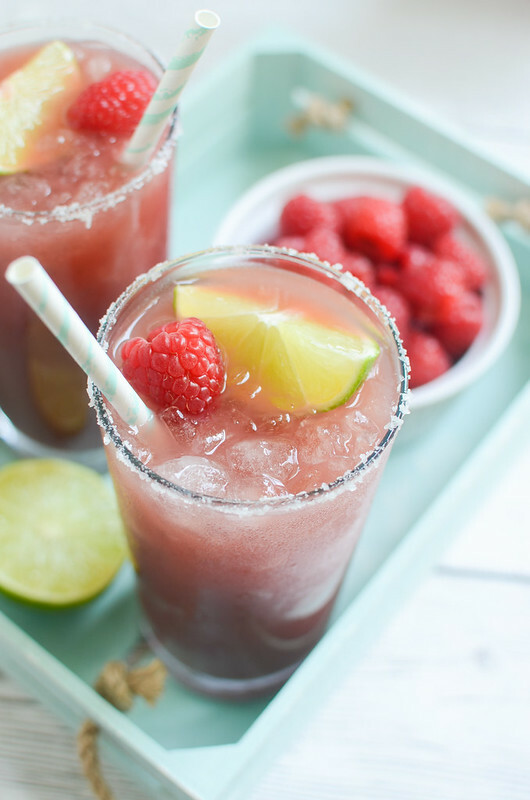 If you happen to end up with a not-so-sweet batch of raspberries, a tiny bit of simple syrup will help sweeten your margaritas. Happy almost Friday! I’m pretty excited for the weekend because I need a vacation after my vacation! Don’t you hate that? We’re wrapping up our summer roadtrip today with an 8 hour drive from New Orleans back to Fort Hood. And by 8 hours, I probably mean 10 because I anticipate lots of stops along the way. I see doughnuts, Happy Meals, lots of Starbucks, and probably an ice cream cone in my future. Hey, I’m gonna live it up on my last day of vacay! 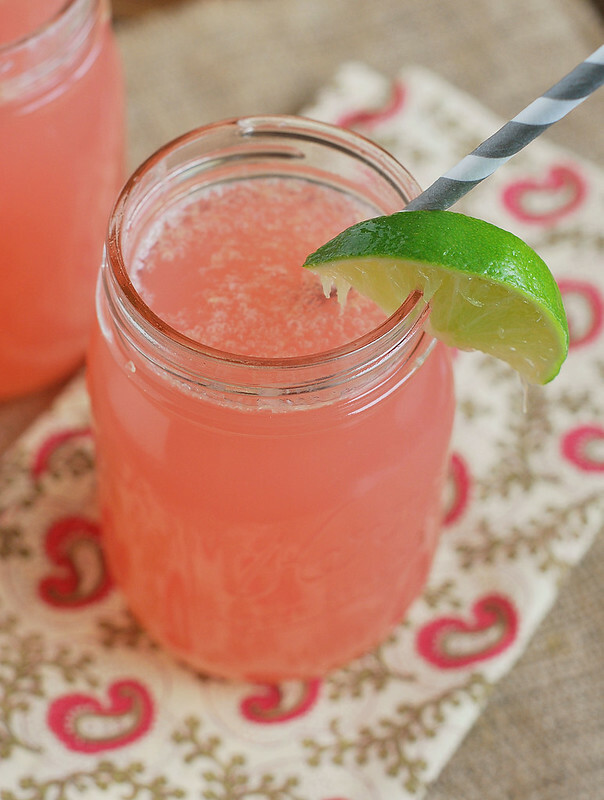 To get you ready for the weekend, I’m sharing this Spiked Watermelon Lemonade! I made it last week before we left for our trip because I knew I needed to cut the grass but I didn’t actually know how to cut the grass. Yes, I know that’s ridiculous. I knew some lemonade would help. 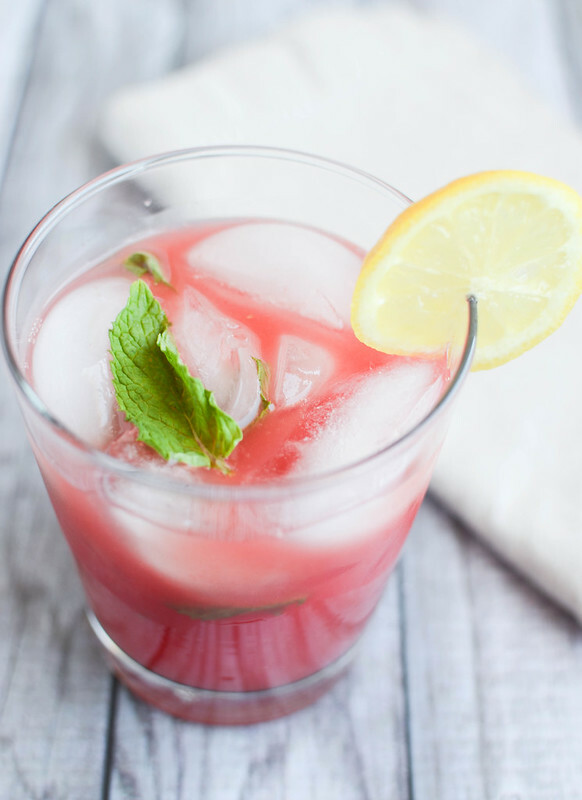 I knew a spiked lemonade would really help. I’m obsessed with all things watermelon this year (every year, really) and this was so perfect. You know that watermelon lemonade candle from Bath and Body Works that you currently have 7 of? Just me? Anyway, this tastes like that smells. But better. Wednesdays are my favorite. Mostly because I’ve become quite the procrastinator and wait until then to do my Thirsty Thursday post. Since I have no choice but to make and photograph the drink when the light is best, I get to have a cocktail in the middle of the day. And by midweek? I need it. But these days Wednesday is also my favorite because it’s HONEY BOO BOO day. 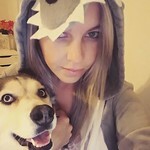 Don’t tell me you don’t love. I won’t believe you. I die a little every time I see the sketti episode or the bingo face episode. So this week Nic asked me what I wanted to do for our drink theme and I said something with tequila so I don’t have to go to the liquor store. Because my husband is out in the field and the liquor store with 3 boys is kind of a nightmare. I don’t really know any drinks with tequila besides margaritas so… here we are. This one is made with guanabana nectar which is supposed to taste kind of like a strawberry, pineapple, citrus fruit, coconut, and banana all at once. I only got the coconut out of it but hey, I’ll never complain about a coconut drink. It was delicious! Go visit Nicole to see her Bloody Maria. I love any drink that you can have at breakfast and not have your fellow diners judge you for it! Pour the lime juice, lemon juice, tequila, orange liquor, powdered sugar, and guanabana nectar in a large cocktail shaker. Add the ice and shake until cold. Put coarse sugar onto a plate. Rub the edge of 4 cocktail glasses with a lime wedge and dip in the coarse sugar. Use cocktail strainer to pour the drinks into the glasses. Serve immediately.